Posted on April 9, 2013	by . Why is the development called Centrale? It is called “Centrale” because it is located in the center of the city where it all happens. Is it a residential or commercial development? The development is mostly residential in nature with a commercial strip at the perimeter of the subdivision to provide homeowners and the public with convenient shopping, office space, dining, and entertainment. Active Group, the same developer of “The Arcadia”, a prime upscale residential community in Ortigas, and other commercial, resort and residential communities all over the country. At the end of La Salle Avenue beside St. Scholastica’s Academy and Eroreco Subdivision. Who are buying lots at Centrale? Most buyers and investors consist of business owners, doctors, OFWs and a small percentage of regular employees. What are other important places nearby? What are the amenities for residential lot owners? What are the residential lot sizes? What are the Centrale lot prices? What are the contact details for inquiries, site visit or price computation? Where can I find photos, maps, or a visual perspective of the development? 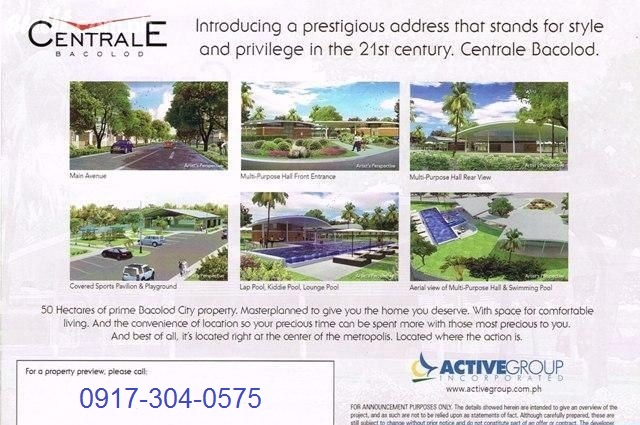 This entry was posted in Centrale Bacolod, Centrale FAQ, Negros Real Estate and tagged Bacolod Centrale lot prices, Bacolod City Lots for Sale, Centrale Bacolod, Centrale Bacolod FAQ, centrale lots for sale bacolod, Lots for sale Bacolod, Negros Real Estate, Real Estate Tips and Advice. Bookmark the permalink.